With a stage set that took several months to build and required the removal of five rows of seating, operating on multiple levels (including subterranean); a live rock band; a huge cast of talented performers, an ancient storyline of love, betrayal and rebellion…and THAT music, well, it would have been hard not to make this show a great one, but the combined talents of Jim Steinman (who if you don’t already know, wrote all the songs and the storyline), Jay Scheib (Director), Emma Portner (choreography), Michael Reed (Musical supervisor) and Jon Bausner (set designer) have created something so truly extraordinary, so heart-thumpingly great, that every performance ends in a standing ovation from a breathless audience. Choosing the let the music speak for itself, Scheib and his team have gathered a cast of young and relatively unknown performers, with one uniting factor – huge voices and boundless energy. The lead role of Strat, leader of The Lost, a rebellious who live below the city of Obsidian and remain forever 18, is performed brilliantly by Andrew Polec, whose CV to date is ridiculously short. He brings an electricity and intensity to every lyric, every move and every word he utters and his voice…blimey, it’s mind-blowingly good. If ever the phrase ‘a star is born’ could be applied, it’s here. 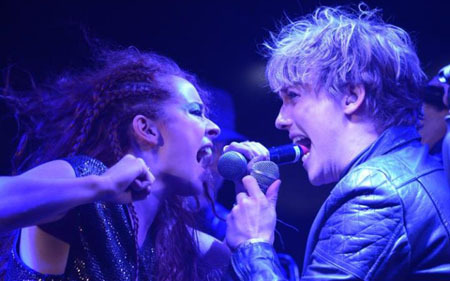 Andrew Polec is most definitely one to watch. Strat’s true love, Raven, is played by Christina Bennington with passion and fire. Her voice soars, power and grace combined. Put the Ravel and Strat together and the stage positively crackles with electricity and the intensity of their duets leaves one rocked – and missing that teenage time when life careered from ecstasy to misery with nothing in between. And it’s not just the leads who dazzle, watch out for a stunning three-way performance of power-ballad of Objects in the Rear View Mirror and a jaw-dropping performance of Dead Ringer for Love that will have you up on your feet, from the glorious Danielle Steers and brilliant Dom Hartley-Harris as Jagwire, who adores his feisty commitment-phobic girlfriend Zahara. It’s not all teenage angst and rebellion however. Raven’s parents, Sloane and Falco, played by experienced musical theatre stalwarts Sharon Sexton and Rob Fowler, bring humour, both light and dark, to many of their scenes. Their performance of Paradise by the Dashboard Light is utterly brilliant, from the vocals to the staging – and the presence of a mortified Raven only adds to the fun. Look out for their heart-breaking duet Which Part Of My Body Hurts The Most, a new song written by Steinman for the show. It’s simply beautiful and I’m praying they release it. Steiman’s music winds itself through every scene, the story-telling of the lyrics a clear reminder that they were indeed originally written for musical theatre, not the rock albums they became, brought to life by the inimitable Meat Loaf. From Bat Out Of Hell to Dead Ringer for Love, from Heaven Can Wait to Two Out of Three Ain’t Bad every song guides us through the storyline, leading us to the glorious ending, and massive hits It’s All Coming Back to Me Now and I’d Do Anything For Love and the audience leaping to its feet before the cast has barely left the stage. 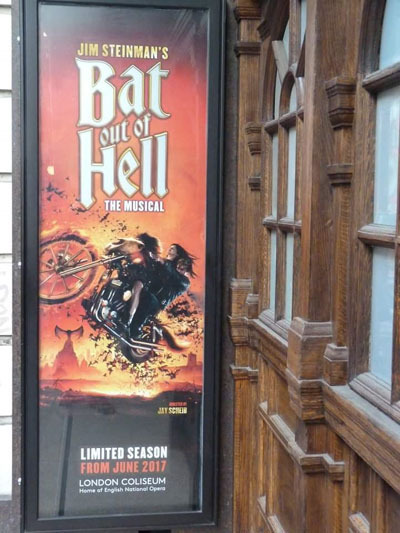 Bat Out Of Hell, The Musical is the best show I have seen since, well, ever. I can’t wait to go back and see it again… and have my tickets booked already.